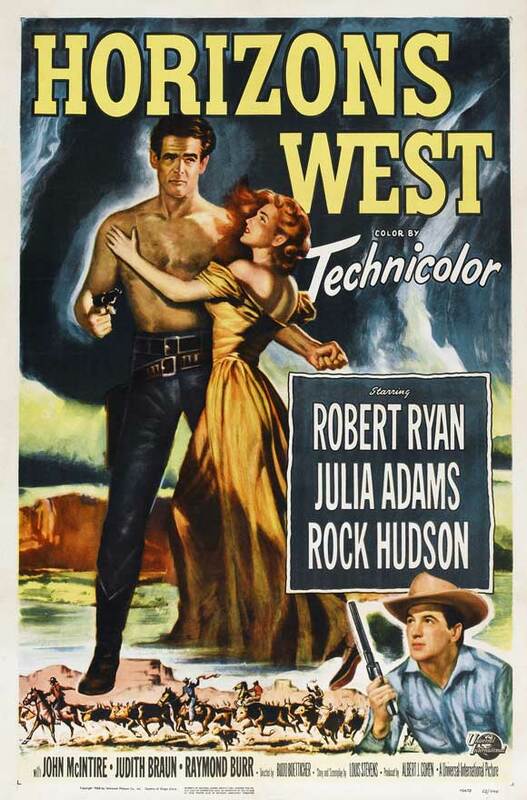 HORIZONS WEST is a colorful Universal Western directed by Budd Boetticher, starring Robert Ryan, Rock Hudson, and Julia (Julie) Adams, plus a slew of familiar faces in supporting roles. Dan (Ryan) and Neal (Hudson) Hammond return to Austin after the Civil War, along with their ranch's foreman, Tiny (James Arness). Neal and Tiny are happy to return to ranching life, and Neal has his eye on pretty Sally (Judith Braun). Dan, on the other hand, has no interest in ranching and wants to make money in a hurry. A big hurry...and he doesn't care how he does it. He also covets the beautiful wife (Adams) of a slimy Austin businessman (Raymond Burr). Dan is soon commanding an army of rustlers and taking over ranches, and Neal sides with the family's friends and neighbors to capture Dan and stop his reign of terror. Generally speaking, I've come to find that I don't care for films about outlaws, because Something Bad always happens...usually over and over again. Films which fall into this Western subgenre tend to be pretty depressing fare. (Universal's THE LAWLESS BREED, released the following year starring Hudson and Adams, is another example.) In HORIZONS WEST I enjoyed the familiar cast and the Universal look, but I can't say I liked the story. The supporting cast includes John McIntire (great, as always), Frances Bavier, Dennis Weaver, Rodolfo Acosta, John Hubbard, Tom Powers, Mae Clarke, and Douglas Fowley. The film runs 81 minutes. This film has been shown in a very nice print on the Encore Westerns Channel. It's available on Region 2 DVD for those who have all-region players. November 2012 Update: HORIZONS WEST will be out on DVD from the TCM Vault Collection in February 2013.